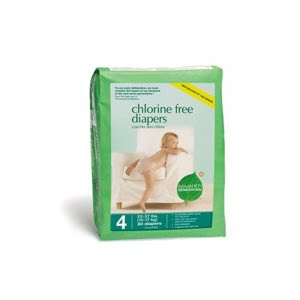 Recently I talked about making the switch from disposable diapers to cloth diapers. Some of you have asked me how that's going. (Ha!) It's actually going really well. For the most part, the transition has been easy. Yes, I do get a little tired of having to remember to cart the diapers outside in between usage and washing but I suppose it's the least I can do. I'm still happy about how much money I'm saving by switching. Still, there are definite times when cloth diapers are oh so not practical and I'm happy to have some disposables on hand. I read another book recently (to be reviewed at the end of this post) which convinced me to switch from Kirkland brand diapers to Seventh Generation diapers. My switch from "average American" to "a more green conscious American" has been gradual and it's been based on books I've read (mostly) over people's stated opinions. Everyone has opinions and I find its fairly easy to ignore the one's I don't like or don't connect with. However, hand me a book and let me think through the arguments myself and come to my own conclusions, and it all works out better. (You can attribute that to a certain stubbornness, yes. However, I also don't read books that appear at the top of the New York Times Bestseller list for the same reason. I am not easily swayed!) First I read the book Squeaky Green and was convinced to change all the cleaning supplies in our house. Enter: Seventh Generation. Then I read Raising Baby Green and made the switch to cloth diapers. Recently I've read Green Goes with Everything and decided that I should ditch the Kirkland brand diapers and try out Seventh Generation diapers (and wipes). We've used Kirkland brand everything (purchased at Costco) due to cost. I reckoned that even though it might not be the healthiest option (or earth friendly, if you will), they were to be used for a very short period of time and it was convenient to me. "Other concerns for ingredients used by this brand: Neurotoxicity, Organ system toxicity (non-reproductive), Irritation (skin, eyes, or lungs), Enhanced skin absorption, Contamination concerns, Occupational hazards"
They don't sound all that healthy, even if I am talking about short term. Say Bookworm1 doesn't potty train until age 3 1/2. That's 3 1/2 years with these diapers pressed up against his skin. I don't really like that thought. Next I searched the Skin Deep site for news on Seventh Generation diapers. They rated a 2 which means they are a "low hazard." I feel more comfortable with that and wish that we had always used Seventh Generation diapers. But I didn't know - and I didn't care! environmental benefits of not contributing to dioxin pollution. Our diapers feature a unique blend of unbleached and totally chlorine and fragrance free materials, resealable tapes, stretchy leg gathers, premium absorbency and soft, cloth-like comfort. They are hypo-allergenic, dermatologist tested and, latex and TBT free." Their tabs are not as sticky as most disposable diapers are and if my son has decided to go without shorts or pants on hot days, it's harder to keep the tabs protected and they come loose more easily. However, we have not had a problem with the diapers falling off. So long as pants are on, the diapers are just fine and work like you would expect them to. Again, we only use them when we're going to be away from the house for any period of time. Most of the time we're using cloth diapers. But Seventh Generation is a great back-up! To buy a box of Kirkland wipes at Costco you are spending roughly $0.02 per wipe. If you buy Seventh Generation wipes off of Amazon and subscribe for the additional 15% of savings, you are paying $0.04 a wipe. Kirkland wipes score a 5 ("moderate hazard") and Seventh Generation scores a 2 ("low hazard"). 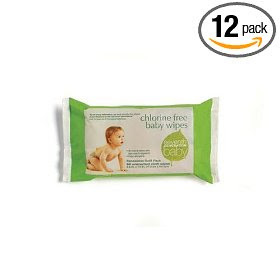 Another little thing to note: if you are using cloth diapers then you are spending as much on disposable ones, allowing for some breathing room in the area of wipes. 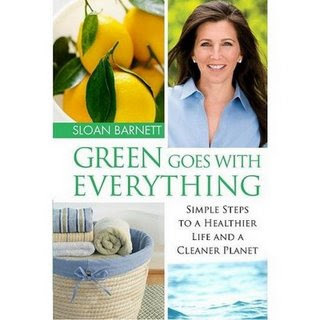 Lastly, if you've made it this far, I'd encourage you to check out the book Green Goes with Everything by Sloan Barnett. I've talked for far too long already but this book has been the most effective towards making me WANT to change not just for cost reasons but for health benefits. Barnett is not overly emotional. She's not writing with a political agenda. She's writing as a mom in a matter-of-fact way that just gives me the facts without the fluff, if you will. Each chapter is clear and easy to understand, and each is followed with the five main bullet point facts that she'd like you to walk away with. This book, which I picked up at the library, has made me change the way I think of food, the way I think about water usage, the brand of diapers and shampoo we use and the mattress we sleep on! Hey, I've even started unplugging the phone chord that we always have plugged into the wall! Mostly, she made me think about choosing for health over costs. Sometimes I think that's a better choice. (Sometimes I don't.) I'm just saying that she's making me think about the health benefits now, whereas before it was strictly cost. I'd like to stress that this book is not a political book. It's one mom's practical (very much so!) tips to another that is a quick and easy read. It's the type of book that lets you form your own conclusions, go at your own pace, and make changes that are comfortable for you to make. No more, no less. I highly recommend it. i'm visiting the 7th Gen site. it might take longer to switch on household cleaners -- "organic" ones i've tried in the past just didn't work as well. Plus, my favorite scent is bleach! but never too late to learn!